A few years ago, some friends and I went camping up in the mountains in PA. During the trip, we took a lot of pictures while we were deep out in the forest. Here’s an interesting picture from our trip in which a shadow person seems be present. (For privacy reasons, my friend asked me to blank out his face). 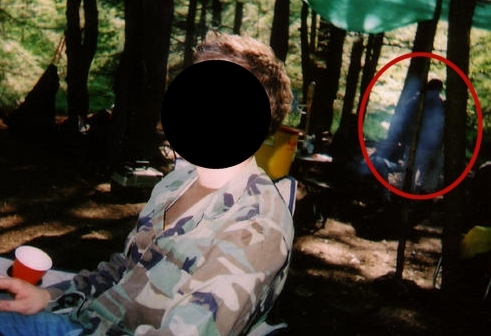 In this picture, you can clearly see a person standing in the trees close to the campsite. There was no one standing there when this picture was taken. There were no other campers in the immediate vicinity. Needless to say we were shocked when the roll of film was developed. 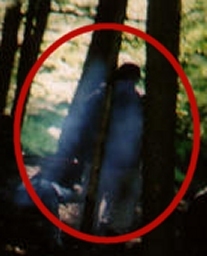 Is this a shadow person? A ghost? What was it doing way out in the middle of the forest? I guess I will never know for sure. My first initial thought, smoke from the fire that is going. Looks like it’s about lunch time or just ending lunch time. 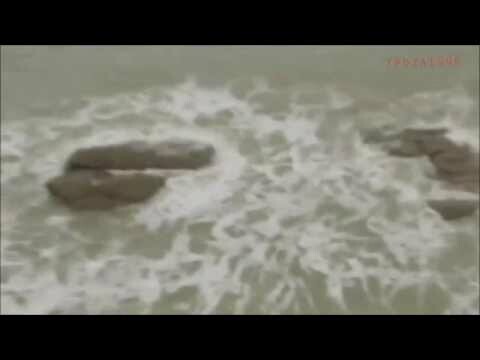 They were probably cooking, tried to put the fire out and thought they did but it was still smoultering under the water. Just like Person said, smoke or water vapor. Ah Ha! Yeah, your right. But still, something fishy about the pic. I’m going out to the same woods again next week, so I will take some more pictures and see if anything shows up. Did you get anything interesting Jason? If you were to enlarge the cropped image, there appears to be an owl sitting on the ground between the two trees. As far as the figure of a person, that’s debatable. It could be just a dead tree there. I think its a person…with a black hoodie on. If one takes a closer look at the shadow person there appears to be a reflection on the left “shoulder”…either its light reflecting off the clothing or the smoke/vapor giving off that illusion. But it also looks like the person has his/her back turned and sitting on something like a tin trashcan or cement block. It’s not a ghost probably just somebody sitting behind her…a living person that is.